That day-to-day sameness can wear you down. But it’s that sameness that is critical to our older loved one’s sense of comfort and familiarity. The variety and novelty you need in your life to feel satisfied can be upsetting to your loved one. For you, variety is the spice of life; it re-energizes you, brings clarity, and sparks new ideas. So how do you break the day-to-day sameness and add variety to your life? 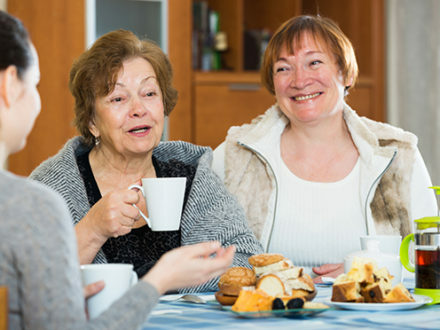 Lexington Area Support Groups include: ​Alzheimer’s Association, Parkinson’s Support Group, American Cancer Society. ​Just say yes. Say yes to any safe opportunity that comes along to get out and take a break from your everyday-ness. If a co-worker asks you to join them in a walk at lunch…say YES! If a neighbor asks you to go for coffee on Saturday morning…say YES! It’s the idea of breaking your pattern and doing something you would not normally do. Start an exercise program and eat healthy. Being active helps you feel your best, lowers your stress, elevates your mood and improves your sleep. Find a program that will fit your lifestyle, your personality and your schedule. Visit the UK Health & Wellness website to learn about their MoveWell and EatWell programs. Use respite care. Ask a family member, neighbor or friend to be a companion to your loved one for a few hours. Allow yourself time to get out and do the things you need to do or to take some time to rest. Try formal respite services, including in-home services, center-based services such as adult day care programs or overnight/week long stays at an assisted living, personal care or memory care facility. If you need help finding respite services, contact UK Elder Care, and we can help you get started finding a service in your area. Recognize signs and symptoms of caregiver stress. In spite of all your best efforts sometimes the routine and repetitiveness of caregiving will get you down. It can be an overwhelming responsibility and can affect how you feel both physically and mentally. Caregivers can become withdrawn, experience increased stress and anxiety and allow depression to set in. Watch out–these negative feelings aren’t instinctively noticed!